Polyprop boards for food preparation, either as individual boards or table surfaces. Available colour coded to allow for different foodstuffs (meat, fish, pultry, cooked /raw etc.) Table size cutting surface manufactured to order. 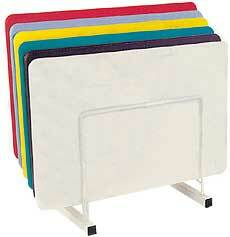 Complete racked cutting board sets available, as well as anti-slip mats and cut-resistant gloves.